One of the greatest services I can provide to buyers and sellers with is a comprehensive view of recreational property. Premier Outdoor Properties has a distinct advantage because we have a unique affiliation with The Mapping Network, a nationwide group of professionals who provide the highest quality and most affordable bathymetric and land mapping products on the market today. The Mapping Network collects data and creates maps for properties that can give the landowners we work with the latest mapping and analysis technology. They offer aquatic services that highlight the dynamics of lake property as well as improving habitat or designing a plan for building a lake or pond. They help us by highlighting the best assets of our listings and by using their innovative products to create specific maps to display to potential buyers. As a partner with their company, some of the properties that we map can even be put on their website as an added referral network for your property. They provide us with the best services, which we then pass onto you. If you are looking to buy or sell recreational property, Premier Outdoor Properties, myself, and the Mapping Network can provide mapping services to highlight a property’s best qualities and unique attributes. Thank you Steve Bartosh and Tyler Van Meeteren for helping me highlight your services. They have done countless maps for me in the past and have helped pave the way to making buyers extremely gratified and sellers exceptionally satisfied. Remember sometimes experiencing the outdoors means knowing everything a property has to offer. The Mapping Network combined with Premier Outdoor properties can give you that information. Experiencing the Outdoors has never been more precise. This entry was posted in Lake Map, Land Mapping, Real Estate and tagged Bathymetric Map, Cabelas Hunting Land, Cabelas Land, Cabelas Land For Sale, Cabelas River, Cabelas Trophy Properties, Cabin, Dredging, Fishing, GIS, GPS Lake, GPS Map, Habitat, Hunting Land, Hunting Property, Lake Management, Lake Map, Lake Mapping, Lake Survey, Land For Sale, Nebraska Deer Hunting, Nebraska Hunting, Nebraska Hunting Land, Nebraska Land For Sale, Nebraska Waterfowl, Premier Outdoor Properties, Sedimentation, The Mapping Network on July 8, 2011 by Moderator. Mike Lashley (Lashley Land & Recreational Brokers) utilizes every cutting edge technology to market his Nebraska recreational properties for sale. Since a large number of buyers come from out of state or even hundreds of miles away in-state, it is critical to help potential buyers gain a feel for the land from their home or office before spending time and money to visit properties. Mike Lashley has teamed up with The Mapping Network for all GPS and GIS mapping products to generate interest for his listings. Using YouTube to show virtual flyovers of properties gives Mr. Lashley a significant competitive advantage in the recreational land market. Nebraska Hunting Land For Sale – This Is One Amazing Piece of Nebraska Real Estate. 3/4 Mile of Niobrara River Frontage and Over 1 Mile of Lucky Creek Running Through the Ranch. You will have to look long and hard to find a ranch like this one. Niobrara River frontage, live creek water, secluded alfalfa fields and tremendous rugged canyon land that is 80% tree covered. There are White-tailed Deer, Mule Deer, Merriams Wild Turkey all in abundance. The ranch borders the Thomas Creek Wildlife Management Area. This is over 1,000 acres of Public Land that is walk-in only hunting. This makes it extremely hard for the Public to get to the back side. It’s like having an extra 1,000 + acres to hunt. What makes this one of the finest deer hunting spots is the 89 acres of alfalfa. These fields are surrounded by tremendous bedding cover. It’s a huge food plot that is miles from the nearest road. I drove my Polaris Ranger within 40 yards of 4 White-tailed Deer. They rarely see people. There is a cozy 4 bedroom, 3 bath house with garage and a good metal building included. The current owner would stay on as a tenant and caretaker. More road development could be made to improve the ranch. The current owner has the equipment and know how to do both. Nebraska Hunting Land For Sale – This Is One Spectacular Piece of Nebraska Real Estate. 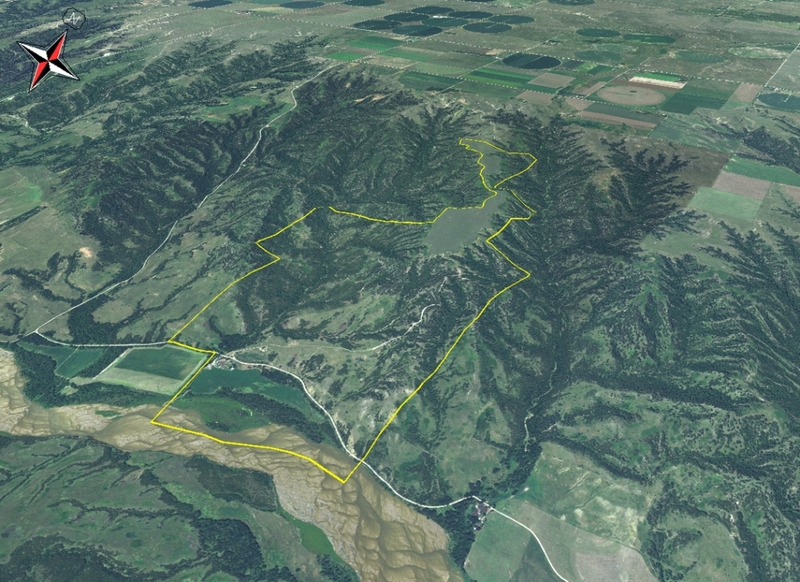 3/4 Mile of Niobrara River Frontage and Over 1 Mile of Lucky Creek Running Through the Ranch. This entry was posted in Land Mapping and tagged Cabelas Hunting Land, Cabelas Land, Cabelas Land For Sale, Cabelas River, Cabelas Trophy Properties, GPS Map, Habitat, Hunting Land, Hunting Property, Land For Sale, Lashley Land, Nebraska, Nebraska Hunting, Nebraska Hunting Land, Nebraska Land For Sale, Nebraska Waterfowl, River Land For Sale, The Mapping Network, Waterfowl on October 6, 2010 by Moderator.